No home is complete without concrete. From the foundation to the driveway, concrete serves as the backbone of every home. Over the past 25 years, Dales Concrete Construction has distiguished ourselves as the leading concrete construction company in Charlotte, Matthews, Mint Hill, and Monroe. 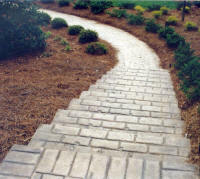 While we are adept at all basic installation methods, we take concrete to the next level. 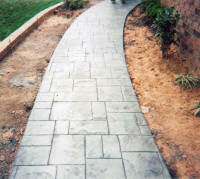 Our designer concrete applications will give your driveway, sidewalk and patio a natural stone, masonry appearence. The wide array of options and combinations available allows you to achieve that "high-end" look at an affordable price. Take some time to visit our Photo Gallery to see some examples of our work and visit our "Catalogue" to see the variety of patterns, textures and stains that we offer, then let your imagination be your guide. Please feel free to contact us to help make your vision become a reality. We look forward to hearing from you. © 2011 - 2013 Dales Concrete Construction. All Rights Reserved.